For those with a lower budget, these Economy Weatherproof Plastic Stanchions are a great alternative to steel/chrome finish stanchion poles. You do not have to sacrifice style for affordability when it comes to managing events that attracts a great crowd. These stands are rustproof, waterproof, and fade resistant and its weatherproof qualities make it perfect to use both in outdoor functions as well as indoor ones. Its hollow base allows for easy transportation but can also be weighed down by filling the base with sand or water to prevent it from knocking over from either wind or any other accidents. 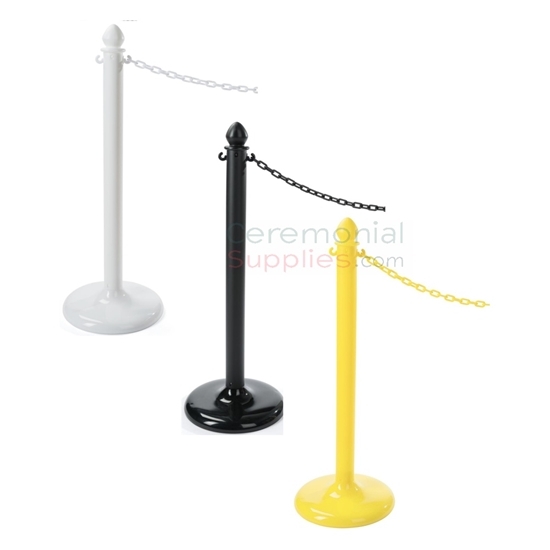 These budget friendly stanchion poles include a matching plastic link chain and requires just minimal and easy assembly.